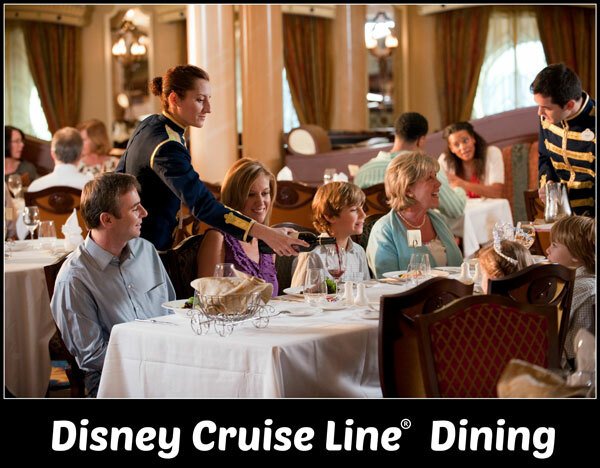 Disney Cruise Line® dining is sure to satisfy the appetites of your entire family—thanks to fresh, expertly prepared dishes made available 24 hours a day. Featuring diverse menus inspired by some of the world’s most intriguing destinations, and restaurants that are distinctly themed and brimming with charm, it’s the finest dining at sea. 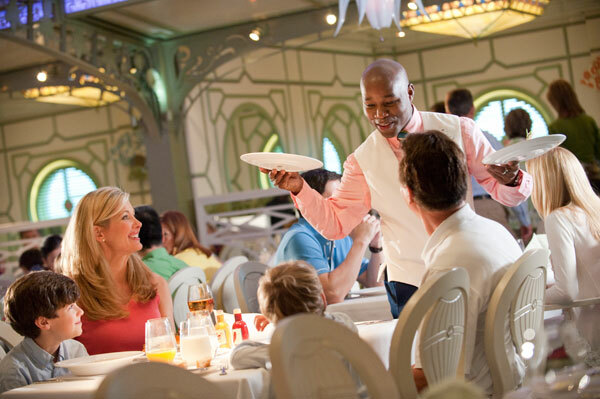 Main Dining – Disney’s innovative Rotational Dining system lets you “rotate” to one of 3 distinctly themed restaurants each night, while your servers follow you from venue to venue. 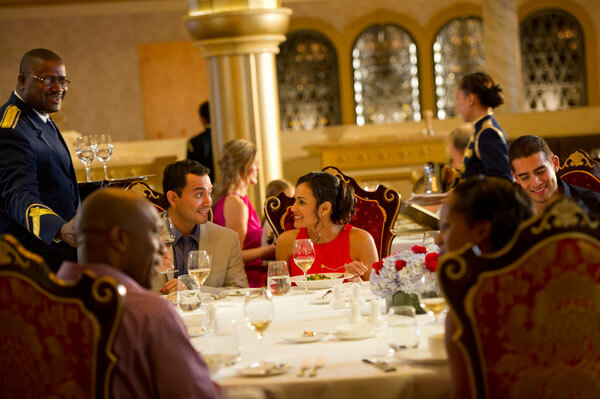 Adult Exclusive Dining – adults 18 and older can enjoy the magic of a more romantic and elegant dining experience during their vacation. Casual Dining – convenient casual dining features an enticing spread of freshly prepared, delicious food items for every family member’s tastes. Enjoy breakfast, lunch or dinner-including self-service food items and made-to-order delicacies-in an air-conditioned setting or on deck side. Quick Service – satisfy those between-meal cravings with a variety of well-balanced and delicious offerings throughout the day, be it morning, noon or night. In-Room Dining – order room service 24 hours a day for breakfast, lunch, dinner and snacks. Dress Code: Changes nightly, check stateroom newsletter for information. Tank tops, swim wear or shorts should not be worn for dinner. 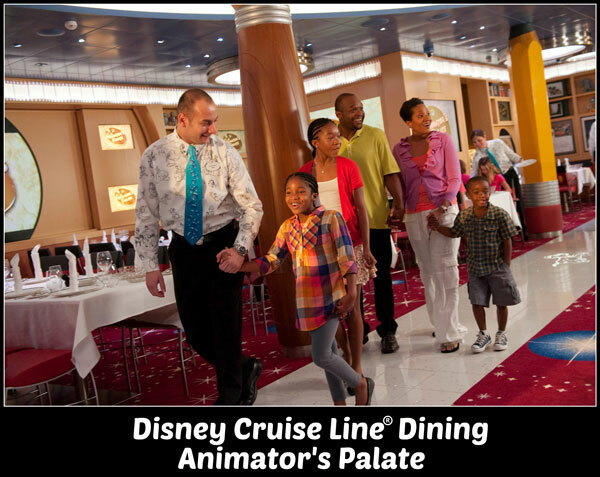 Savor a dining experience that caters to the magic of animation. Step into an ever-changing environment that begins in black and white, and blooms into the wonderful world of color from Disney’s classic animated films. 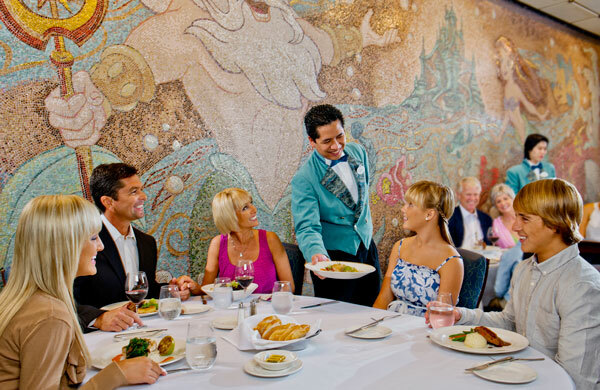 Enjoy both fabulous food and the brilliance of Disney’s greatest artists in a marvelous meal that’s always a celebration. Dress Code: Changes nightly, check stateroom newsletter for information. Tank tops and swimwear should not be worn in the dining room. Carioca’s is inspired by the charming facades and architecture of Rio de Janeiro adorned with fun festival lanterns, and the signature black and white sidewalk pattern of Copacabana. Carioca’s is designed to be festive during the day and transform into an elegant courtyard through lighting and a beautiful nighttime panoramic view of the city of Rio de Janeiro. Jose Carioca and his friends Donald Duck and Panchito are portrayed in a fun mural that welcomes the Guests. Named after King Triton from the Disney film The Little Mermaid, this grand ballroom recalls a transatlantic ocean liner with a dazzling Art Deco theme. It brims with ornate chandeliers, stained glass walls and a mural with an “under the sea” theme. Enjoy a 4-course dinner with a distinct French-inspired twist. Breakfast and lunch boast American classics for Guests choosing to either remain on the ship or forgo the buffets. Find yourself in the center of a classic Disney fairy-tale where much of the restaurant’s décor is inspired by classic Disney films like Cinderella, Snow White and the Seven Dwarfs, Sleeping Beauty and Beauty and the Beast. Resplendent décor includes ornate marble floors, a luxurious rose carpet and an elaborate chandelier brimming with glass slippers and roses, along with hand-painted portraits of Disney princesses and princes. Named after the candelabra in Disney’s animated film Beauty and the Beast, make your way into a spacious ballroom, where glowing rose flowers hang in glass domes with Art Deco columns. Offering a scrumptious 4-course dinner, enjoy a selection of cuisine with a distinct French-inspired twist. Breakfast and lunch boast American-inspired classics for Guests choosing to either remain on the ship or forgo the buffets. Inspired by the relaxed feel of the tropics, step into a festive and brightly colored room that recalls careless days on the beach. Parquet wood floors, shutters, large green leaves and khaki bamboo furniture mingle amid a turquoise-blue setting. During the 4-course dinner, enjoy a selection of Caribbean-island grill inspired cuisine for Guests of all ages. Inspired by the picturesque gardens of Versailles, this restaurant boasts a market-inspired menu from around the world for breakfast, lunch and dinner – while transforming magically from day to night over the course of the meal. Flower light fixtures “bloom” in color and the ceiling changes from a brilliant blue, to golden red and finally into a constellation of twinkling stars. Adding to the idyllic atmosphere is a 7-foot tall cascading fountain with a Mickey Mouse stone cherub. Dress Code: Champagne Brunch: Cruise casual wear is suggested. No shorts, swimwear, tank tops or blue jeans. Dinner: Men are required to wear a dress shirt or jacket. For women a dress or pantsuit is recommended. No shorts, swimwear, tank tops or blue jeans. Booking: Guests will skip the regularly scheduled Main Dining restaurant. Reservations are required. Cancellation: Must be cancelled by 2:00 p.m. the day of the reservation to avoid receiving the full dining charge to the onboard account. Experience elegant dining in an intimate atmosphere exclusively for adults. Over subtle classical Italian music, this restaurant offers dinner nightly on all cruises, and on cruises that are 4-nights or longer, guests have the option of enjoying brunch as well. Named after the long poles used to push and pull gondolas, Venetian masks adorn the walls, a backlit bar sits at the center and an open kitchen adds to the magic. Elegant glass, inlaid wood paneling and sweeping panoramic floor-to-ceiling ocean views make this the perfect setting for Guests 18 or older looking for a more intimate or romantic experience. Dress Code: Men: A jacket is required (e.g. sports, suit or tuxedo) with dress pants/slacks and dress shoes. Ties are optional. Women: Cocktail dress, dressy pant suit, skirt/blouse or nice dress. No jeans, shorts, capri pants, sandals, flip-flops or tennis shoes. 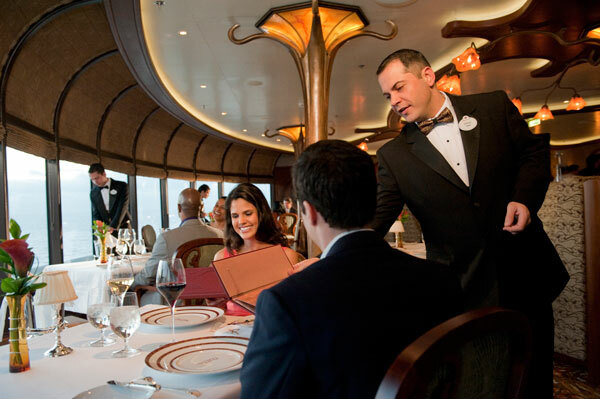 Booking: Guests will skip the regularly scheduled Main Dining restaurant for dinner. Advance reservations can be made as follows. Offering the most upscale dining experience onboard for Guests 18 and older, relish spectacular ocean views and sophisticated décor. Like an authentic fine-dining restaurant in France, the luxurious dining room is softly lit and designed in a timeless Art Nouveau style. Adding to the refined ambience, tables are set with Frette linens, Riedel glassware, Christofle silverware and china created exclusively for the restaurant. The gourmet menu was created by Chef Arnaud Lallement from l’Assiette Champenoise—a Michelin 2-star restaurant just outside Reims, France—and Chef Scott Hunnel from award-winning Victoria & Albert’s at Walt Disney World® Resort. An elegant Champagne Brunch is also available during ‘at sea’ days on sailings of 4-Nights or longer and features a French-inspired cuisine. Guests can meet with a sommelier in Remy’s wine room to taste and pre-select their wines for the evening. Please note, alcoholic beverages are available for an extra charge. A special Chef’s Table room (8 Guests Required) offers a unique multi-course menu while interacting with the head chef. The room has elegant décor, shimmering chandeliers and scenes of Paris on the walls. Dine in a luxurious glass-walled room with marble flooring amid more than 900 bottles of rare selection Old World and New World wines (Note: not private, part of main room). Beach Blanket Buffet – Delight in this tasty, tempting buffet for a casual breakfast and lunch on the Disney Wonder®. 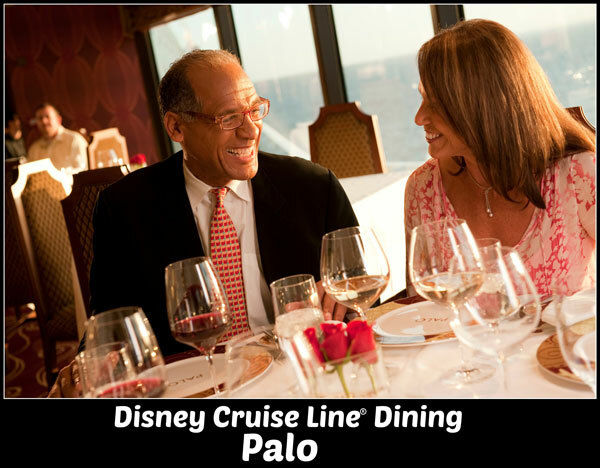 Choose to enjoy your meal in the lively indoor area or the open air of the dazzling deck. Pinocchio’s Pizzeria – Savor the flavor of real Italian pizza: traditional cheese, pepperoni and a scrumptious special every day — along with tasty tropical drinks for the entire family — at this fun spot near Goofy’s Pool. Pluto’s Dog House Snack Bar – Sink your paws into the best hot dogs, bratwurst, burgers (meat, fish, and veggie! ), chicken tenders and chili tacos at this tasty spot right by Mickey’s Pool. Scoops – Treat yourself to scrumptious soft serve ice cream with tempting toppings, along with delicious fresh fruit, crunchy cookies and tasty wraps in this yummy-yielding snack bar near Mickey’s Pool. Topsider Buffet – Enjoy fabulous food indoors or on a spacious open deck overlooking the horizon. Savor wide-ranging delights for a casual breakfast, lunch and dinner from this Disney Magic® buffet that’s always delicious!